Painting these rosette succulents are so much fun because they are so colorful and have such an interesting shape. I recently discovered these amazing plants at the Kauai Nursery. I bought some, but my chickens loved them so much they pecked them. Only on Kauai! 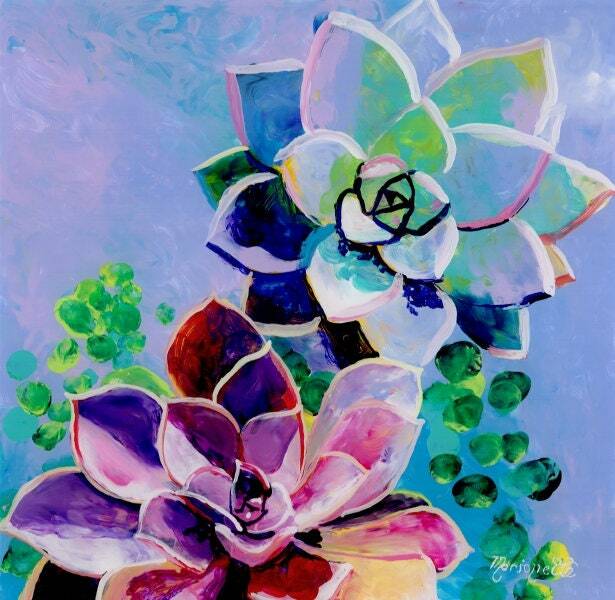 "Rosette Succulents" is an original acrylic painting on plexiglass measuring 12"x12" and painted in a "reverse" style which means the foreground is painted first and the background last. The painted side is actually on the back of the 1/8" plexiglass. Colors may vary slightly from monitor to monitor.